Since attending the very last Los Angeles Rams home game as a loyal fan on Christmas Eve 1994, I can count the fingers on one hand the number of NFL games I’ve attended as a fan or media member. As a member of the media I worked Super Bowl XXXII won by Denver over Green Bay in San Diego in January of 1998 —the final Broncos home game at old Mile High Stadium in Denver on “Christmas Eve, Eve” 2000– the Broncos first home game at the new Mile High Stadium September 10th 2011and, as a fan along with my wife, attended the San Diego Chargers final pre-season game of 2009. 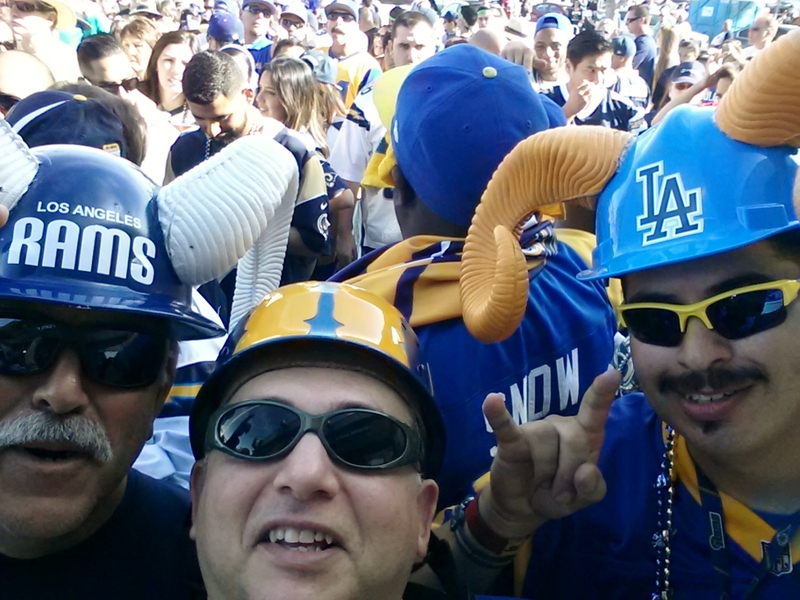 From left to right, Joe Ramirez, myself and Aron Gonzalez ready to welcome the Rams home – back in Southern California. The one for the thumb occurred Sunday, November 22nd as a fan, back in San Diego at Qualcomm Stadium, to watch the Chargers host the St. Louis Rams. The very same Rams I grew up with and considered part of my family up until the day they announced they were leaving for the Midwest not long after that 24-21 Christmas Eve ’94 loss to the Washington Redskins at Anaheim Stadium. The first Rams game I attended in person in 19 years, 11 months. When I was a kid in the 70s my Father, Henri, designed clothes for then-L.A. Rams owner Carroll Rosenbloom, general manager Don Klosterman, head coach Chuck Knox and some players. They were around my Dad’s store in Beverly Hills all the time so that made them my family. And when they were there, so was I. The Rams are the leaders among three teams with stadium issues in their current homes favored to relocate back to Los Angeles as soon as next season. The other two are the Oakland Raiders and, ironically, the Chargers. 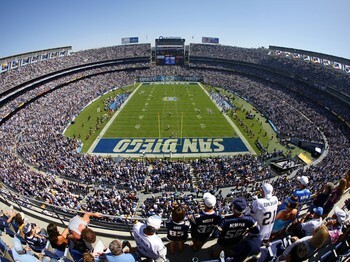 A capacity crowd at the “Q” in San Diego of 66,000+ with at least 40% of it being L.A. fans of the St. Louis Rams. Led by the Southern California Rams Booster Club – the largest Rams booster club in the world – and the Bring Back the Los Angeles Rams movement, other Rams booster clubs from up and down California as well as Arizona and Seattle, Washington – that’s right, Seattle – organized and planned for a Los Angeles Rams takeover of the “Q” as soon as the schedule came out last year. Takeover the “Q” they – WE – did. 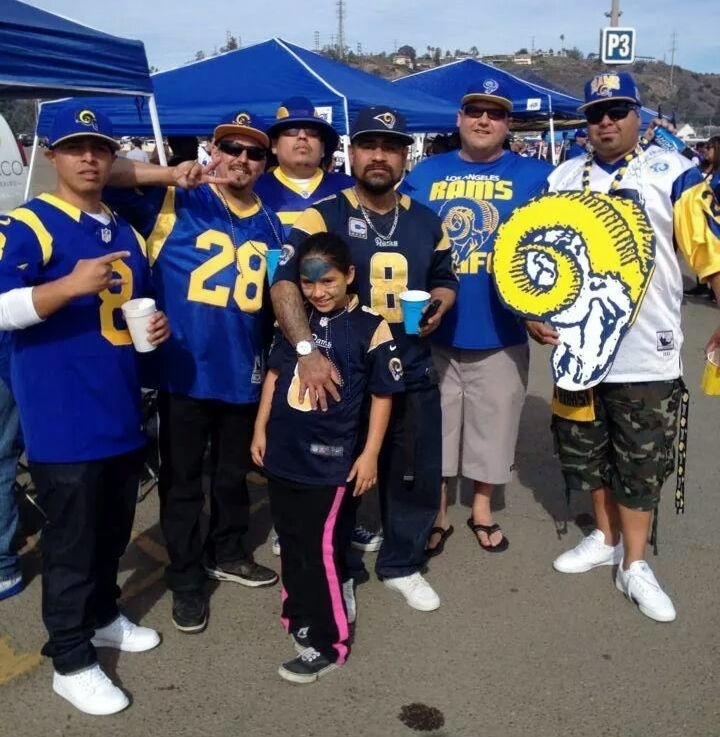 Members of the Southern California Rams Booster Club – the largest Rams booster club in the world – enjoy some tailgating prior to kickoff. It was an opportunity for L.A. Rams fans to relive some memories. Let’s not forget the Rams called Southern California home – playing at the Coliseum then the Big A – for 49 years prior to the move east. It was also an opportunity to show Rams owner Stan Kroenke he has an L.A. fan base ready to support the team should he relocate them back to L.A.
Needless to say, the L.A. fans took full advantage of that opportunity. According to the San Diego Chargers they sold some 20,000 tickets to Los Angeles Rams fans. Add those tickets bought through independent ticket agencies like Stub Hub – which is where I purchased my ticket – upwards of 35% to 40% of the 66,000+ football fans in the stadium for Sunday’s game were Los Angeles fans of the St. Louis Rams. About an hour prior to kickoff Kroenke and Chargers owner Dean Spanos were having a conversation near the Rams bench. Rams fans from L.A. began chanting “Bring them home, Stan!” and “L.A. Rams!” He heard every chant. Sitting in my seat right behind the west end zone I was stunned to see so much old school regal blue and sun gold jerseys, hats t-shirts and anything Rams from the L.A. days around that stadium. So were the Chargers fans. Rams owner Stan Kroenke (rt) sharing pleasantries with Chargers owner Dean Spanos before kickoff. Chants of “Go Chargers, Go!” were met with as many “Defense, Defense!” and “L.A. Rams! L.A. Rams!” chants. Fox TV cameras showing fans behind the Rams bench telling the world where they want their team. All this was not missed by those players who played to the crowd throughout the game as well as the Fox television cameras and commentators. It was a playoff atmosphere. Similar looking to the Big A, being at the “Q” reminded me of those Sunday afternoons spent at Anaheim Stadium watching the Rams “back in the day.” Ram fans on every seating level and every deck. When they left for St. Louis I felt betrayed and indifferent from then on when watching them play. I was told they moved because we, I, didn’t support them because of the many things to do in Southern California. A complete slap in the face to my loyalty and love for the Rams, win or lose. Members of the So. Cal. Rams Booster Club & Rams World Order in the stands behind the Rams bench. Well, if that were the case, if we hadn’t supported the Rams because of the many things to do around here on a Sunday afternoon it stands to reason ex-owner Daniel Reeves – who brought the Rams to L.A. from Cleveland in the mid-40s – would’ve moved the team within five years. He didn’t and the Rams were here for 49 years. Current Rams owner Stan Kroenke saw that love and loyalty for the team on full display on Sunday. For the Ram fans from L.A. doing all the chanting at the “Q” on Sunday, the takeover was a success. To the NFL, the St. Louis Rams and the naysayers around the country who say L.A. never supported and won’t support a team, you’re wrong. The Rams lost the game in a heart-breaking fashion they used to do often when they called L.A. home. With a chance to win late in the game, they turned the ball over losing 27-24. 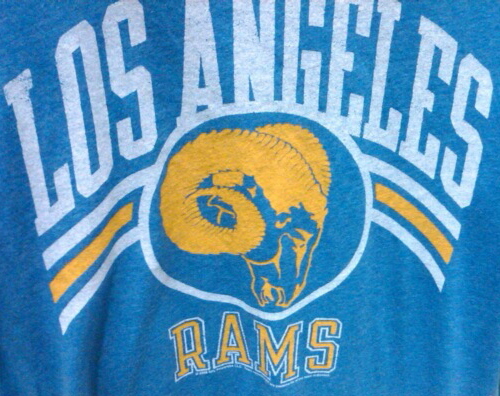 For the Los Angeles fans of the St. Louis Rams, it was a win. Their message was heard loud and clear. They got plenty of T.V. time visually and audibly. They – WE – could be rewarded with a return of the Rams as soon as next season. A perfect time for a Golden Anniversary Celebration. Your comments are always greatly appreciated. This coming Sunday, the Dallas Cowboys and Jacksonville Jaguars will play the third and final game of this NFL season’s International Series at Wembley Stadium in London, England. The series began as an experiment in 2007 by the National Football League to gauge interest of the sport in the European marketplace. And although the second largest media market in this country – Los Angeles – is on the verge of landing not one but possibly two NFL teams as soon as maybe next season after being without a team for 20 years, the League is still hell-bent on putting a team across the pond in London by 2022. Commissioned by the NFL and a London marketing agency, the accounting firm DeLoitte released its findings last week from their study that said an NFL franchise based in London could generate more than $255 million for Britain annually. In British pounds, we’re talking 165 million. Pounds. Dollars. No matter what currency you reference, that’s a whole lot of coin the 32 team owners can’t ignore. So, what about the fans both in the States and the British Isles? A majority of NFL fans here don’t like the idea of putting a team in London because of travel logistics and the idea that it would be similar to out-sourcing American jobs to foreign countries. 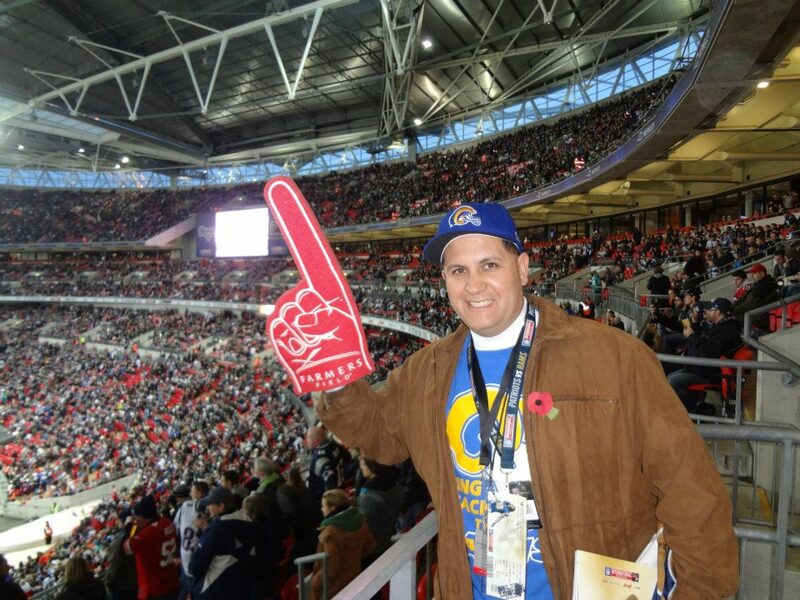 Tom Bateman, director of Bring Back the Los Angeles Rams, traveled to London in 2012 to watch the St. Louis Rams play the New England Patriots. As for the Brits, L.A. native Tom Bateman, the director of Bring Back the Los Angeles Rams, traveled to merry old England for a week in October of 2012 to watch the St. Louis Rams take on the New England Patriots. While there, Bateman spoke with British fans he discovered enjoy American football immensely but think the idea of putting a team in London permanently is a silly one. I agree with the Brits. If a team is moved or an expansion team is awarded to London, would the league’s name be changed to the International Football League? 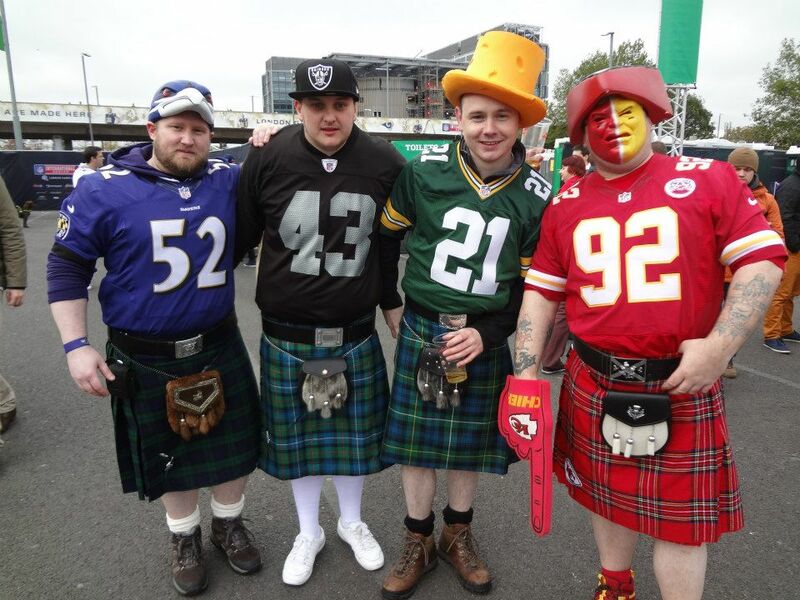 British tailgaters “dressed to kilt” at the 2012 NFL International Series Game between the St. Louis Rams and New England Patriots played at Wembley Stadium in London. He also discovered an NFL game represents everything the British love about America. According to Bateman the Brits love the fact that we’re a show off nation. Really, no sport or league shows off more than the NFL. Also on the NFL’s agenda, sooner rather than later, is reducing the pre-season schedule from four games to two while expanding the regular season from its current 16-game schedule to 18. An 18-game schedule is something the Players’ Union isn’t too keen on for player safety and the extra two games don’t increase the players’ salaries. What about a little compromise for all parties involved so the 32 team owners, the players and Britain’s annual economy can capitalize on the projected $255 million the NFL stands to generate should it have a permanent presence in London. Since the Brits enjoy seeing different teams play each International Series game and the logistics of having a permanent team call London home seem a bit difficult to iron out, let’s give the Brits what they want. 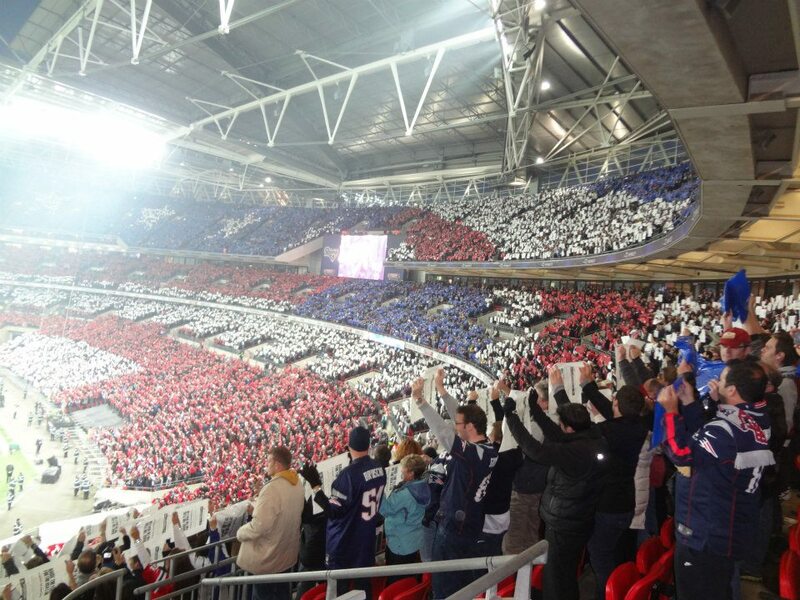 America’s Game – NFL Football – celebrated at Wembley Stadium in London. At the same time, let’s expand the regular season from 16 to 17 regular season games with the extra game for each team played each week at Wembley Stadium in London. So what if it’s an odd number schedule. Only thing affected is a team finishing .500 which isn’t a huge deal in the grand playoff scheme of things. This way, only teams with winning records would qualify for the postseason. Make the 17th game match ups interconference games – AFC vs. NFC – with the match ups chosen with ping pong ball machines much like the ones used to choose the World Cup soccer groups or the NBA Draft Lottery and do it during Super Bowl Week for games in the upcoming regular season. Cut the pre-season to just two games. You’ve added a game while having an entire regular season schedule – 16 weeks – in London with the Brits seeing all 32 NFL teams in different match ups each game and year. It becomes a “pseudo Super Bowl” each week in London because the logistics time wise of having the Super Bowl in London – which has been discussed – just won’t work for NFL fans in the States who want to see the biggest game and spectacle on U.S. soil and rightfully so. After all, it is America’s Game. Somewhere all 32 teams need to always call home. Members of Bring Back the L.A. Rams listen to Inglewood Mayor James T. Butts discussing bringing the NFL to Hollywood Park. 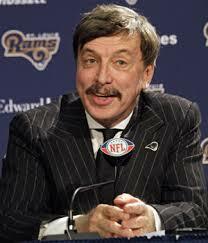 St. Louis Rams owner Stan Kroenke owns 60 acres of Inglewood land. 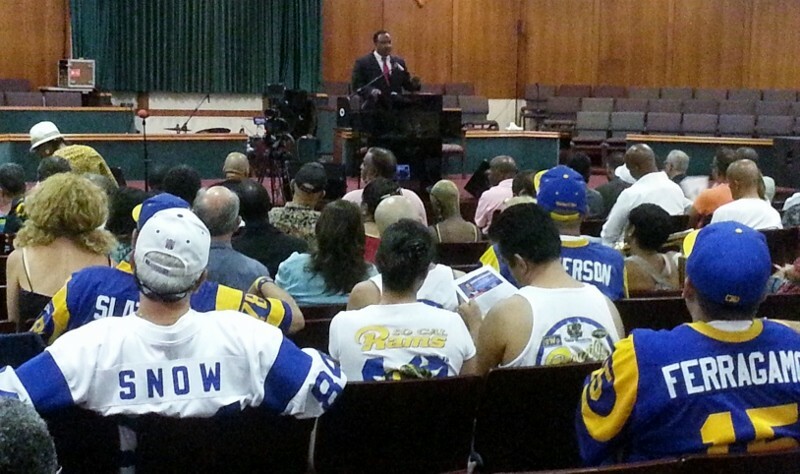 That’s the message mayor James T. Butts gave an overflow crowd of some 500 residents at a town hall meeting this past weekend, most of whom would like to lure an NFL team to what is known as the City of Champions – Inglewood, CA. “We have the largest single continuous block of land in Southern California and there is interest in development of some type,” said Butts referring to St. Louis Rams owner Stan Kroenke. 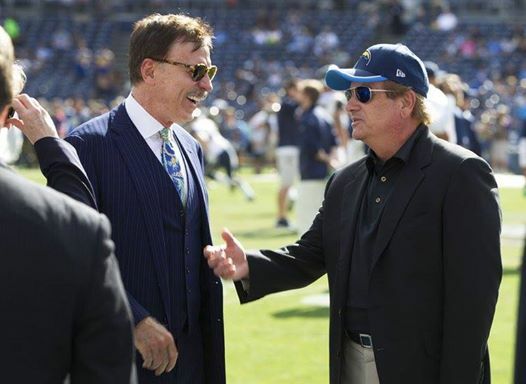 The multi-billionaire Missouri native and Rams’ owner – who has a home in Malibu – purchased 60 acres of land earlier this year that sits between the Fabulous Forum and the now closed Hollywood Park Racetrack. It’s being demolished to make room for a 238-acre residential and business complex called Hollywood Park Tomorrow. Hollywood Park Tomorrow is part of an almost 300-acre plot of land ready for development with ample parking. There’s talk that Kroenke could eventually buy more land from the developers of the Hollywood Park Tomorrow project who might consider selling some of those 238 total acres. The St. Louis Rams – who called the Los Angeles area home for 49 years prior to their move to the Midwest in 1995 – are “free agents” if you will after this season. A top-tier stipulation in the team’s lease with the St. Louis Convention and Visitors Commission(CVC) negotiated by ex-L.A. Rams general manager John Shaw prior to the move, stated that if theEdward Jones Dome (then known as the Trans World Dome) isn’t in the top 25% of all NFL stadiums after 20 seasons, the team goes year-to-year effectively allowing it to move anywhere. Last year an arbiter ruled in favor of a Rams $700 million proposal to upgrade the Dome, while the CVC’s $126 million plan was ruled not enough to make the Dome one of the top eight stadiums in the league. Inglewood is known as the City of Champions because of the racetrack, which opened in 1938 and had a 75-year run until it closed last year; the Fabulous Forum which opened in 1967 with its main tenants being the Los Angeles Lakers – who won six NBA Championships while calling Inglewood home until the team moved to Staples Center in downtown L.A. prior to the 1999-2000 season – and the NHL’s Los Angeles Kings who moved to Staples Center along with the Lakers. Having been without a major professional sports franchise going on 15 years and counting, and with the closing of the racetrack last year, Mayor Butts and the residents of Inglewood – which number more than 110,000 people – would like nothing better than to be the home of L.A.’s NFL team as part of the city’s revitalization and keep that City of Champions moniker. While all the residents are in favor of bringing the NFL to Inglewood some don’t want the traffic a team and football games would bring. The newly remodeled Fabulous Forum – owned by MSG Entertainment – is home to world class concerts. While Butts told me he hasn’t spoken to the NFL or Kroenke about a stadium, when the billionaire owner of an NFL team buys 60 acres of prime developmental real estate in the middle of your city, you’re going to have discussions about what he plans to do with it. To hear more of my interview with Mayor Butts click on the video with this article. 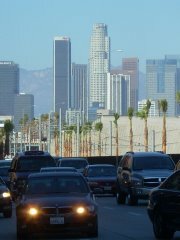 Los Angeles – the second largest media market in the country with more than 18 million residents and includes Ventura County to the north, Orange County to the south, the Pacific Ocean to the west, the Inland Empire to the east, and everything in between – has been without an NFL team since both the Rams and Raiders left after the 1994 season. Many stadium proposals have come and gone over the past two decades in an attempt to bring the NFL back to the City of Angels. None more prominent than AEG’s Farmers Field proposal, which was to be financed privately by AEG in downtown L.A. in conjunction with the remodel of the Convention Center. In September 2012 the L.A. City Council unanimously approved a deal with AEG to build Farmers Field. Although the stadium is shovel-ready, no ground has been broken because of one major detail: AEG doesn’t own an NFL team. AEG won’t spend the almost $2 billion price tag to build the stadium without an agreement from any of the NFL team owners looking for better digs in return for a significant percentage of a team. A third of a team for a stadium is a price tag none of the 32 owners is willing to pay. And the clock is ticking because the deal between the City of Los Angeles and AEG to build Farmers Field expires in October of this year. If AEG doesn’t file for an extension by October 18th, Farmers Field is essentially dead. When time runs out, the City of L.A. goes to Plan B focusing all its attention on remodeling the Convention Center. Kroenke has a team, owns enough land in Inglewood to build a stadium, and coupled with ex-Microsoft CEO Steve Ballmer’s recent purchase of the NBA’s Los Angeles Clippers for a hefty $2 billion, the NFL has amped up its efforts to return to L.A. Considering NFL officials have always toyed with the idea of building a Hall-of-Fame West and a stadium-site NFL Network studio, Los Angeles, home to Hollywood – the Entertainment Capital of the World – as well as Inglewood, is destined to be home to an NFL team sooner rather than later. And that team could very well be the Rams who playing in St. Louis are ranked dead last in franchise value, according to Forbes. A move to Los Angeles could very well increase their value from the current $930 million to what the Clippers were recently purchased for: $2 billion. We could all soon find out. 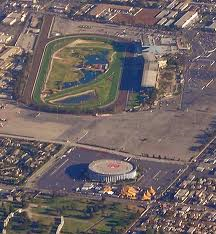 Rams owner Stan Kroenke purchased 60 acres of land between the Fabulous forum and Hollywood Park. According to unnamed sources, St. Louis Rams owner Stanley Enos Kroenke – the native of St. Louis named after Cardinals baseball legends Stan “the Man” Musial and Enos Slaughter – has purchased 60 acres of land in Inglewood sitting between the Fabulous Forum and Hollywood Park. Just enough land to build a top tier football stadium. As I wrote in an article earlier this week, St. Louis’ sports media and fans have to be worried about the Los Angeles Rams. The St. Louis media and football fans said L.A. wasn’t a factor going all-in on the outright lie that L.A. was a failure when it came to supporting an NFL team when in actuality L.A. supported the Rams 49 years prior to their move to the Midwest. The St. Louis media said it was “in the know” about behind-the-scenes negotiations between the Rams and St. Louis for a new stadium. Stan Kroenke wants a top tier stadium for his Rams. They said “Silent Stan” would build his own stadium in St. Louis. It seems they were half right. He might build his own stadium. In Los Angeles. Not St. Louis. The Rams – and Raiders – move out of Los Angeles was all about stadium issues. Specifically, the lack of modern NFL ready facilities in the greater Los Angeles/Orange County areas. If you’re still not convinced L.A. supported an NFL team, listen to ex-Los Angeles Rams stars Jack Youngblood and Bob Klein in interviews I did with each about two years ago. Adding Hollywood Park to the shovel-ready Farmers Field site in Downtown L.A., it appears the Rams moving back to Los Angeles is seriously in play. If St. Louis wasn’t worried about the Los Angeles Rams before, you can bet they are now. This purchase gives Stanley Enos Kroenke amazing tourque with much leverage in his pursuit of a top tier stadium for his Rams in St. Louis or anywhere. 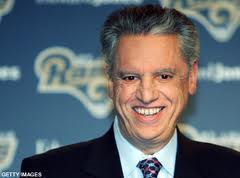 Ex-Rams GM John Shaw negotiated the “sweetheart lease” that moved the Rams to St Louis in 1995. That “sweetheart lease” negotiated by then Los Angeles Rams GM John Shaw moving the team to St. Louis for the 1995 season has stipulations in it calling for the Edward Jones Dome – formerly known as the Trans World Dome – to be in the top 25% of all NFL stadiums 10 and 20 years into the lease, or the Rams are free to go year-to-year in the Gateway City or move on to greener pastures. It’s still too early to really tell what “Silent Stan” will do. By now you know the story. Arbiters ruled the Rams’ request for $700 million in upgrades to the EJD were approved while St. Louis’ plan for a $120 million upgrade isn’t an upgrade at all. The Edward Jones Dome needs a $700 million face-lift St. Louis can’t afford. St. Louis can’t afford $700 million for a football stadium. So, now we wait until the end of the upcoming season. That’s when that top-tier stipulation hits year 20 making the Rams free agents to play where they want. What we do know is “Silent Stan’s” purchase of 60 acres of land at Hollywood Park has St. Louis hearing him loud and clear. It seems the Los Angeles Rams 20-year road trip might be coming to an end. Hope you’re still enjoying that “sweetheart lease,” St. Louis! Downtown Los Angeles skyline at dusk. Let me immediately debunk a serious cliché, untruth and down-right lie in regards to WE Angelenos. Well, the part about plenty of things to do on a Sunday afternoon is spot-on. 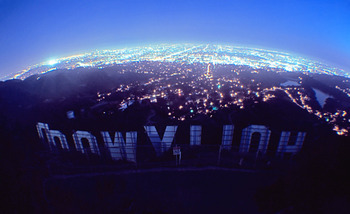 But, that’s what makes the City of Angels one of the greatest cities in the world. The part about WE WON’T SUPPORT and NEVER HAVE SUPPORTED an NFL team is the biggest bunch of absolute garbage I’ve ever heard or read. This clichéd rhetoric is old, tired, ignorant and completely false. It’s a complete insult to all of US Angelenos. Looking at L.A. from atop the Hollywood Sign. Los Angeles, the second largest market in the country, home to Hollywood, a pair of MLB teams (Dodgers & Angels), a pair of NBA teams (Lakers & Clippers…and maybe the Anaheim Royals soon. ), a pair of NHL teams (Kings & Ducks) a pair of major division one universities (USC & UCLA) and a pair of MLS teams (Galaxy & Chivas USA) isn’t called the entertainment capital of the world for nothing. And although a sport, football, which includes the NFL variety, is one of the greatest forms of entertainment known to man, woman and child. 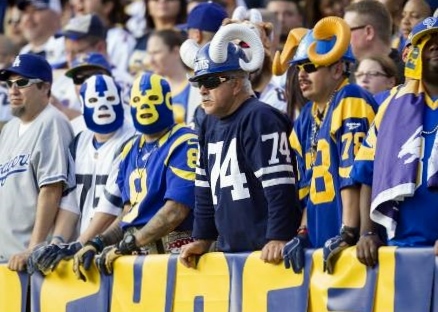 All I have to do is cite the Los Angeles Rams, the gold-standard among many pro football teams that have called L.A. home, as my example of WE Angelenos SUPPORTING an NFL team. The L.A. Coliseum opened on May 1st 1923. Beginning in 1946, after their move from Cleveland because they couldn’t compete with the Browns, the Los Angeles Rams called Southern California home for 49 years. The first 34 at the 100,000 seat L.A. Memorial Coliseum and the last 15 at Anaheim Stadium before moving to the Midwest in 1995. Had the Rams not been supported by WE Angelenos throughout that half-century, you figure they would have left after year five. 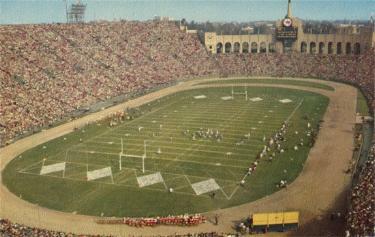 The Rams called the Coliseum home from 1946 to '79. 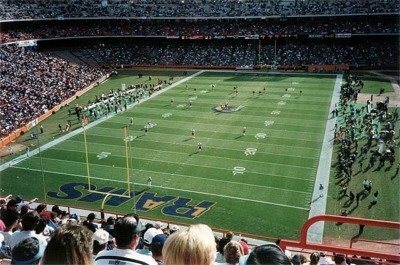 During a 13 year period in the modern Super Bowl era from 1967 to 1979, the Rams won nine division titles, seven of those in consecutive seasons, played in seven conference championship games and one Super Bowl all the while attracting crowds at the Coliseum in excess of 65,000 to over 70,000 every Sunday afternoon. In my interview with Hall-of-Fame defensive end Jack Youngblood and tight end Bob Klein, stars for the Rams during those years, both told me they fed off the energy of those Coliseum crowds. Fans that are still devoted to them today. The Rams averaged just under 60,000 fans per regular season game in the 34 years they played at the Coliseum including three of the top-ten all-time league attendance single-game records exceeding 100,000 fans in the stands. Rams called Anaheim Stadium home from 1980-'94. The first 12 seasons in Anaheim, they averaged about 57,000 fans. The years 1992-94 saw a significant drop-off due to rumors of a potential move first to Baltimore and, later, St. Louis. The Rams averaged about 45,000 fans those final three seasons. Most team owners in any professional sport relocate because they can’t get the city they call home to ante up, via public funding, for a brand new arena with all the modern amenities to maximize revenue for them and their team. 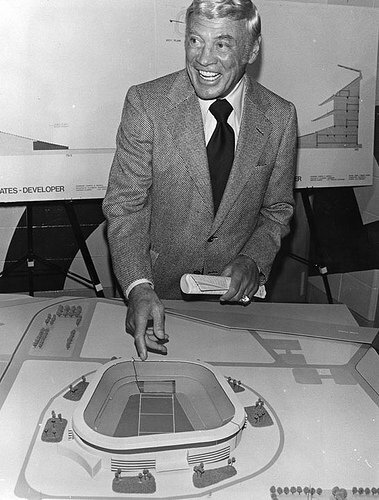 Ex-Rams owner Carroll Rosenbloom with a model of the Football-enclosed Anaheim Stadium. Former L.A. Rams owner Carroll Rosenbloom left L.A. for Anaheim in ’79 because the Coliseum Commission and L.A. politicians wouldn’t fork over taxpayer dollars to upgrade the Coliseum. Anaheim DID enclosing the Big “A” without its then-primary tenant, the California Angels, reaping any benefits whatsoever, so it could gain elite status as a city that an NFL team called home. That changed in the early 90s when Georgia Frontiere wanted upgrades to the Big A via public funding. Anaheim said not this time. Off the Rams went to St. Louis. St. Louis city officials and the state of Missouri gave the Rams everything they wanted and more including a new stadium in 1995 to return the Gateway City to elite NFL status after the Cardinals bolted a few years earlier for Arizona. 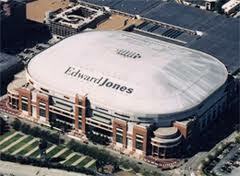 The 17 year old Edward Jones Dome is already obsolete by NFL standards. The tables have now turned for the Gateway City. The Edwards Jones Dome needs upgrades the Rams negotiated in their original contract. St. Louis wants the Rams to pay more than half with taxpayers footing the rest of the bill. Currently the Rams, Minnesota Vikings, Oakland Raiders, San Diego Chargers, Jacksonville Jaguars and Buffalo Bills are the NFL franchises looking to upgrade their stadium situations and join the 21st Century NFL. It’s why Al Davis moved the Raiders to L.A. from Oakland in 1982 and then back to Oakland in ‘95. ‘84 when Bob Irsay moved the Colts from Baltimore for Indianapolis. ‘87 when Bill Bidwell moved the Cardinals from St. Louis to Phoenix. ’95 when Frontiere moved the Rams to St. Louis from Anaheim. ‘96 when Art Modell moved the Browns from Cleveland to Baltimore. ’97 when Bud Adams moved the Oilers to Tennessee from Houston. These owners didn’t pack up their teams and leave their former cities because of the lack of fan support. It always has been and will be about stadium upgrade issues. San Diego's Qualcomm Stadium is one of the 3 most outdated stadiums in the NFL. Not coincidentally, the San Diego Chargers and Oakland Raiders are on the possible relocation list because they play in two of the three most outdated stadiums in the NFL. The San Francisco 49ers were on the list playing in the third. 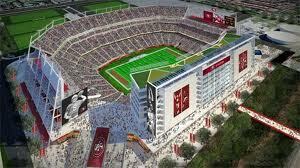 The 49ers new stadium in Santa Clara is scheduled to open in 2014. The 49ers will be playing in a brand new $1.2 billion facility within the next couple of years in Santa Clara. A building privately funded with the 49ers borrowing $400 million. The Santa Clara Stadium Authority borrowing $450 million. $150 million from the league’s stadium fund. $40 million from the Santa Clara City Redevelopment Agency with the final $35 million coming from a hotel tax paid by tourists and visitors to the city. I bring these three teams up because, if you include the L.A. Coliseum and Pasadena Rose Bowl, California has the five most archaic “NFL-ready” stadiums. Anaheim Stadium’s out of play because it’s now a baseball-only stadium if you don’t count a high school gridiron clash or two. California’s citizens and its government entities won’t consider stadium plans of any sort to be publicly-funded using taxpayer dollars. Especially in these tough economic times. We’re absolutely right not to. That’s why the state is home to the five most archaic “NFL-ready” stadiums in the country. This is the ONLY reason why Los Angeles hasn’t been a part of the NFL for 17 seasons and counting. AEG is targeting a 2017 grand opening of Farmers Field in Los Angeles. This “extended road-trip” Los Angeles has endured could be coming to an end soon with not just one, but possibly two teams, from the list relocating here. "Tailgating L.A. Style." An artist's rendition of Chick Hearn Court on Game-Day Sunday. Nokia Theatre and restaurants on the right. Staples Center in the left foreground. Farmers Field in left background. The Anschutz Entertainment Group (AEG) privately funded the Downtown Los Angeles Corridor Revitalization building the Staple Center and L.A. Live, and now is committed to privately fund, without taxpayer/public dollars, the entire construction of the $1.4 billion L.A. Convention Center and Farmers Field. AEG’s already invested over $40 million, $27 million of those for an environmental impact report and the balance going to designs for the new convention center and football stadium. Upon releasing the 10,000 page EIR earlier this month on the steps of L.A.‘s City Hall, point-man Tim Leiweke addressed AEG’s vision for the return of the NFL to the City of Angels. A team could be calling L.A. home in September of 2013 playing its home games at the Coliseum until Farmers Field is completed by 2017. As for which team it will be. Take a look at the aforementioned list. The Rams (if any team should call L.A. home, it should be the Rams.) and the Vikings are the top two candidates for various reasons. Who will it be? It’s going to happen. L.A. will be back in the NFL and the NFL will be back in Los Angeles. From any angle, it’s quite overdue. Yes. There are plenty of things to do on a Sunday afternoon in the City of Angels, one of the greatest cities in the world, and the NFL should and will be one of them. Photo courtesy: Eric Geller, AEG, Farmers Field, Los Angeles Times, stadiumsofprofootball.com, USA Today. No Time To Panic For Me Or Favre! -Everything’s going according to plan for the Chargers. They’re out of the shoot with a two and three record for the fourth consecutive season. Remember, San Diego’s gone on to win the AFC West the previous three. Bolts have severed ties with former all-pro LB Shawn Merriman who’s been injury-plagued the last three seasons, this year being hampered by a badly strained left calf muscle. Bolts will trade him when he’s off the injury list with the Rams being one of the teams with some interest. Good news, WR Vincent Jackson will be back by Halloween. QB Phillip Rivers lighting up opposing defenses. Unfortunately, the Chargers special teams have been atrocious and responsible for two losses including last week’s to the Raiders causing this Chargers Fan much heartache! -This one’s dubbed “The Panic Bowl” because both these one and three teams had Super Bowl aspirations. Winner’s right back in the fold, the loser might as well fold. Vikings are the better team. They have a huge pass rush on defense. On offense, QB Brett Favre’s had issues both on and off the field. There’s that sexual harassment thing from two years ago involving another female reporter who seems to be looking for publicity. On the field, Favre’s dealing with some tendonitis in his throwing elbow and, now, an injured groin suffered in practice and caught on tape. Another favorite 3 STOOGES short film called THREE LITTLE PIGSKINS (1935). Game footage shot at GILMORE STADIUM which stood near the corner of FAIRFAX & THIRD in Los Angeles. Lucille Ball is featured in this one. ENJOY! I Need to Bounce Back after Last Week’s Debacle! What a rough week. Worst ever for me. I’ll make a huge comeback today even though I’m sidelined and under the weather. Speaking of this week’s injury report, here’s ESPN’s Steve Levy. Special Teams and Kickers Kicked My A&&!! The Chargers Special Teams, Kicker Sebastian Janikowski of the Raiders & Saints kicker Garrett Hartley all played like “Huxley College”. Dedicated to them, one of my favorite “football comedy bits” provided by the Marx Brothers in HORSE FEATHERS. Fitting Houston’s at Oakland. Hall-of-Famer George Blanda played in both cities (Oilers & Raiders) as well as in Chicago with the Bears during his remarkable 26 year NFL/AFL career. Blanda passed away this past week at 83. Here’s a tribute to one of the most amazing players ever courtesy of the NFL Network. R.I.P George Blanda. Are the Rams Returning to the City of Angels? I don’t want to get too excited about the Rams returning to Los Angeles because I really don’t like to count my proverbial chickens before they hatch and find myself with bitter disappointment. But………Can it be? Are the Moons aligning? In the names of Merlin, Youngblood, Deacon, Crazy Legs and Roman, are the Rams beginning the process of moving back to Los Angeles? At the moment, all signs seem to be pointing in that very direction. Published reports from St. Louis and Los Angeles are abuzz with stories regarding the sale of the Rams and two possible sites in the greater Los Angeles area for a state-of-the-art NFL stadium. In the “Gateway City”, writers from the St. Louis Globe-Democrat and the St. Louis Post-Dispatch believe St. Louis losing an NFL franchise for the second time seems inevitable while Bernie Miklasz of stltoday.com and ESPN Radio refuses to suggest such a notion even though he clearly sees the writing on the wall. Rams minority owner Stan Kroenke wants full control of the franchise and is looking to purchase it from Chip Rosenbloom and Lucia Rodriguez. At issue, Kroenke owns the NBA’s Denver Nuggets and the NHL’s Colorado Avalanche. The NFL has rules against cross-ownership of teams in other major U.S. sports leagues. Kroenke seems to be able to clear such hurdles by signing over controlling interests of his other major sports teams to other family members. Kroenke, also, seems to be working with L.A. sports & entertainment big-wigs to get them back where they belong, LOS ANGELES. It means Kroenke is privy to every detail, every plan, simply everything that is related to those trying to get a stadium built there. Then on Thursday, Los Angeles Times columnist Sam Farmer wrote that businessmen Casey Wasserman, who owned the L.A. Avengers of the defunct Arena Football League, and AEG’s Tim Leiweke are considering a plan to build a privately funded stadium behind the Staples Center where the West Hall of the Convention Center currently sits. They tried this about eight years ago, but they backed out when the Coliseum Commission tried to make its own bid that, also, failed. In a follow-up article from Saturday’s L.A. Times, Farmer added Wasserman and Leiweke want the proposed $1 billion stadium to have a retractable roof for use year round for a number of other events. The Coliseum Commission isn’t a factor any longer because it’s locked in with USC which has rights of first refusal because the Trojans football team is the Coliseum’s major tenant. 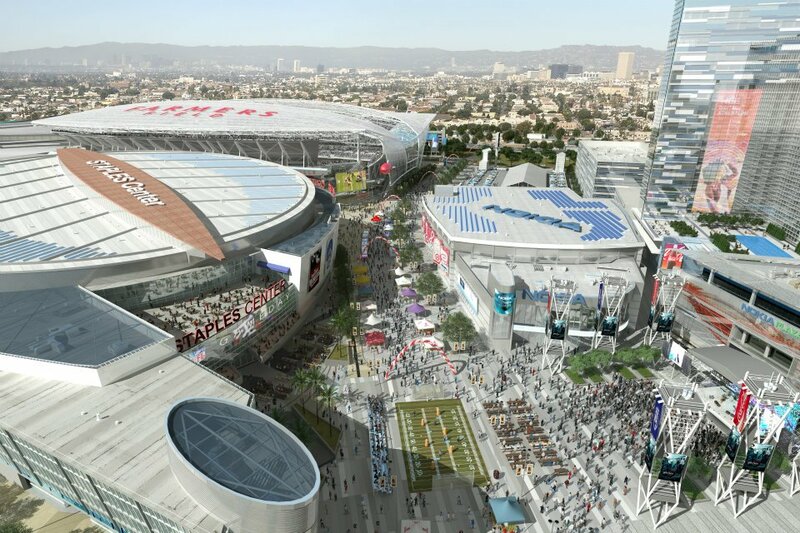 The stadium would complete the L.A. Live entertainment corridor that was envisioned by AEG when the Staples Center was first built. Of course, the stadium proposal would need to be approved by the City of Los Angeles because the convention center is owned by the city. What’s more, the downtown bid would put Wasserman and Leiweke in direct competition with developer Ed Roski, who already has an entitled and shovel-ready piece of land in City of Industry to build a football stadium. There is only room for one such project in the L.A. area, and the Industry group is at least a year ahead of any other because it has clearance to build. Another problem exists with the NFL. The current collective bargaining agreement ends after next season. The league is trying to avoid a labor dispute and subsequent work-stoppage in 2011. The sticking point, team owners want the players to help in paying off the huge stadium costs. The new CBA will take at least a year to negotiate which means no stadium will be built or team will re-locate while the NFL takes care of its CBA. That’ll give Wasserman and Lewieke a year to catch up with Roski. When the time comes, I think these two competing stadium teams might want to join forces and work together on one site to benefit the greater Los Angeles Area, the NFL, maybe the Rams, and, first and foremost, the long suffering Los Angeles Rams fans. The Rams called Los Angeles home for 49 years before (gulp) Georgia Frontiere moved them to St. Louis in 1994 claiming Los Angeles wouldn’t support them because there was too much to do in Southern California other than watch football. I said it then and I’ll say it now. HELLO! 49 YEARS! Needless to say, Georgia pulled a “Major League” getting a sweet money deal in St. Louis while still residing in Bel-Air. 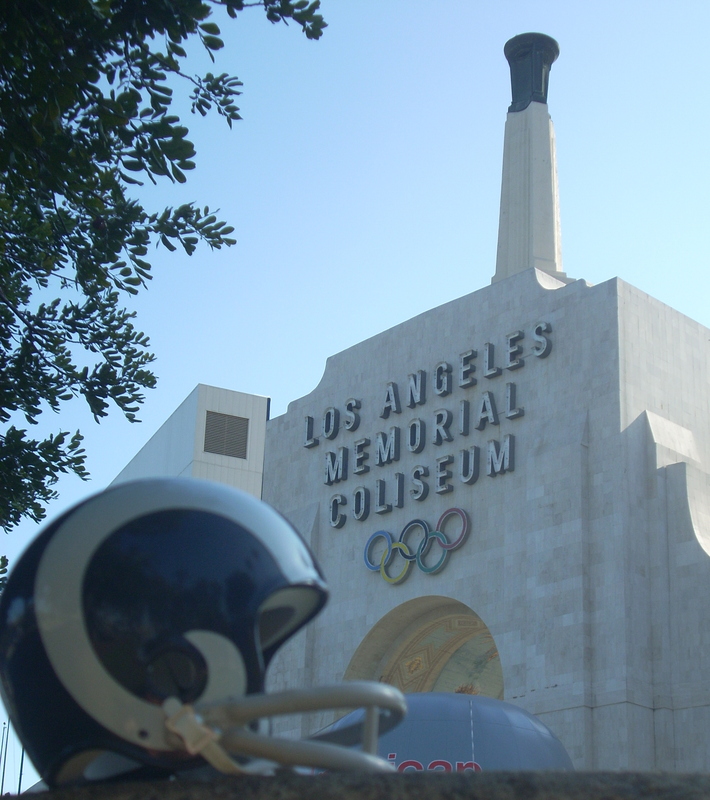 The City of Angels could soon be celebrating the Rams 50th Anniversary in Los Angeles (16 years, and counting, in the making) with St. Louis losing its second NFL franchise. That doesn’t have to happen. Here’s a thought. When the Rams move back to Los Angeles, how about moving the struggling Jacksonville Jaguars to St. Louis and re-naming them the Stallions. Wasn’t that the idea when the league expanded 16 years ago anyway? As far as a second team in the new Los Angeles Stadium. Do you really think Chargers owner Alex Spanos will sit put in San Diego and play in an aging Qualcomm Stadium when he can move his team into a state-of-the-art play-pen back in its original home just up Interstate 5?